A space sail is a device that uses the pressure of sunlight, laser light, or some other form of radiated energy to propel a space vehicle in the same way that a sailing ship uses wind. It consists essentially of a large sheet of reflective material and a supporting framework to keep it extended and to transmit its pressure to the spacecraft. For more details of the basic principles involved and of the history of the concept, see solar sail. Recently, another variation on the space sail theme has been proposed: the magnetic sail, or magsail.2, 3 One form of this would be a loop of superconducting wire reeled out from a spacecraft in which a current was made to flow. Once started the current would continue cycling around the loop indefinitely because a superconductor offers no resistance. The magnetic field generated by the current loop would interact with charged particles in the solar wind to imparting momentum to the magsail and thus accelerate the spacecraft in the direction of the wind. At roughly the distance of Earth from the Sun, this would be sufficient over time for the magsail to reach speeds of several hundred km/s. Even more speculative are the diode sail, differential sail, and induction sail – three of the propulsion systems proposed by Mark Millis of NASA's Breakthrough Propulsion Physics program. 1. Forward, R. L., "Roundtrip Interstellar Travel Using Laser-Pushed Lightsails," Journal of Spaceflight, 21(2), 187-195 (1984). 2. 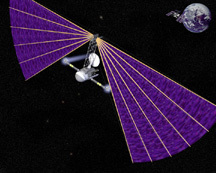 Andrews, D. G., and Zubrin, R. M., "Use of Magnetic Sails for Advanced Exploration Missions." In Vision-21: Space Travel for the Next Millennium, edited by G. Landis. NASA CP-10059, April 1990. 3. Zubrin, R. M., and Andrews, D. G., "Magnetic Sails and Interplanetary Travel," AIAA 89-2441, AIAA/ASMA 25th Joint Propulsion Conference, Monterey, Calif., July 10-12, 1989. 4. Zubrin, Robert, and Wagner, Richard. The Case for Mars: The Plan to Settle the Red Planet and Why We Must. New York: Simon & Schuster, 1997.